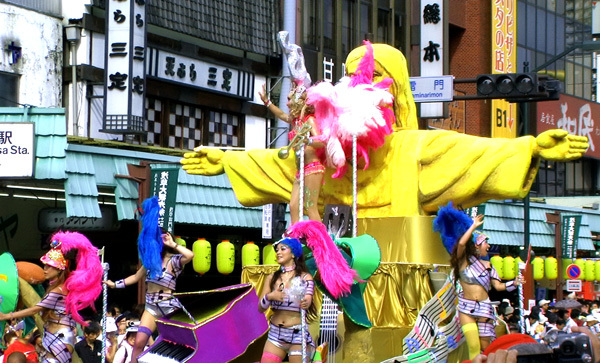 Tokyo's traditional Asakusa district once more swayed and bopped to the exotic strains of Brazilian samba music. 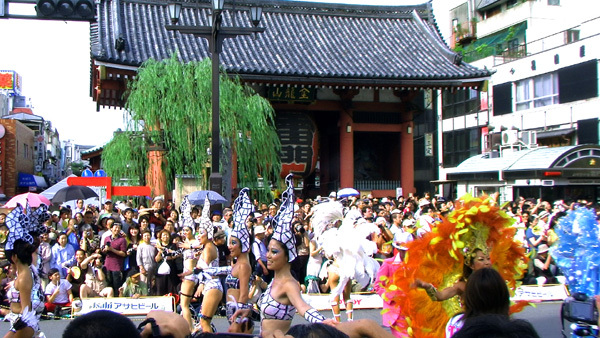 Asakusa's annual Samba Carnival festival took place this past Saturday, Aug. 30. Asakusa has been holding this event on the last Saturday of August for over 20 years and it never fails to draw a huge crowd. Nigh-naked be-feathered dancing samba girls move to the beat of Brazilian music and the feverish whirl and click of thousands of cameras held sweatily in hand by overly-enthusiastic photographers. 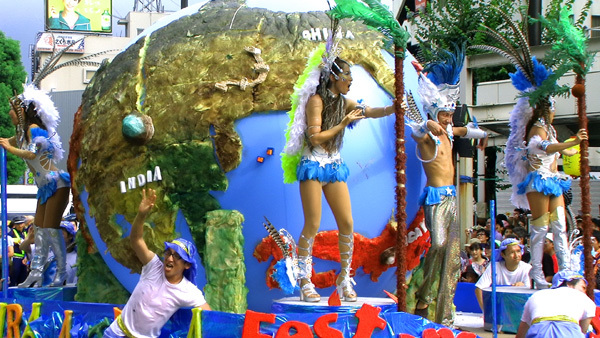 Every year, the samba groups choose a theme for their presentation. 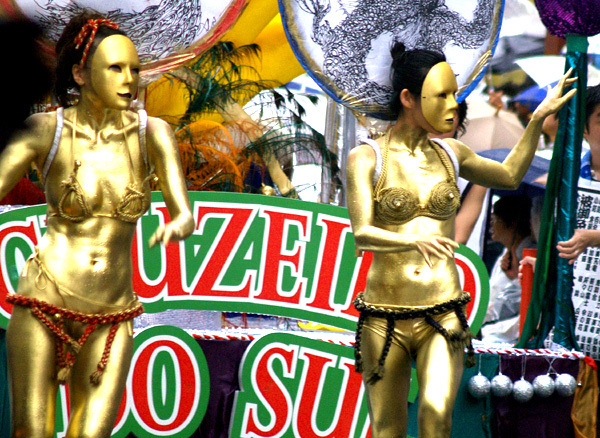 The nigh-naked samba girls are nearly always the same with feathers, tiara, and sequins but their companions sport different costumes every year based on a chosen theme. 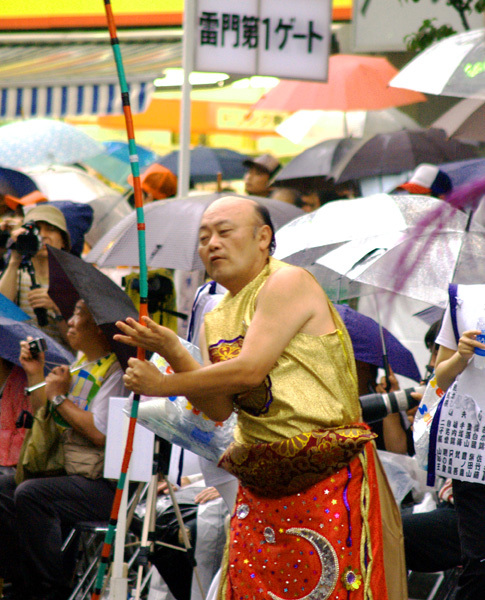 One group's theme was based on sumo. 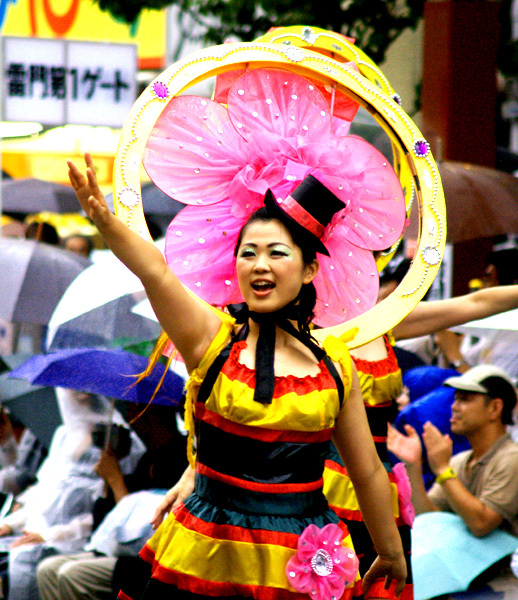 Two performers twirled bows similar to the way that sumo wrestlers do at the end of each day of a sumo tournament. 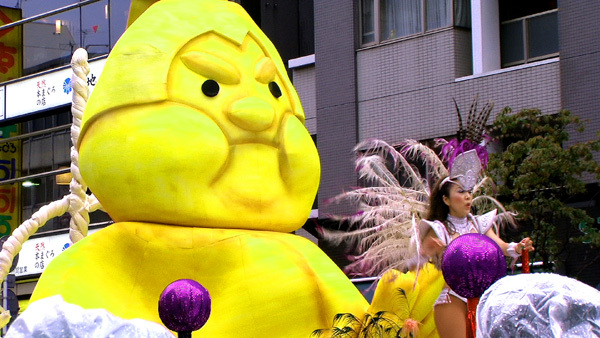 A large float was made out to depict a Yokozuna - sumo champion. The strangest part of the group by far were four golden gals wearing masks and very little else. 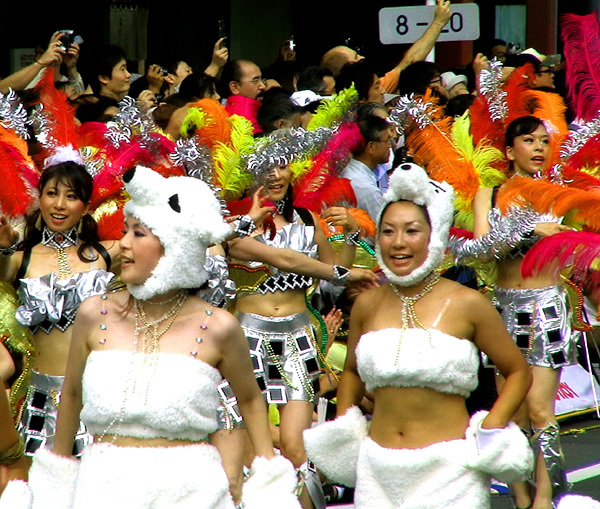 This year saw a bit of Akihabara otaku (nerd) culture mixed with saucy samba. 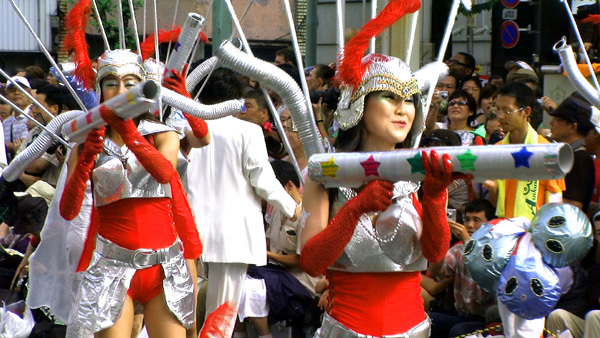 Scantily-clad girls in outlandish sci-fi outfit pretended to fire space age cannons in rhythm to the music. The musicians were dressed like the bug-eyed abducting type aliens who appear in all those UFO documentaries and redneck nightmares. There were no probes to be seen, however. 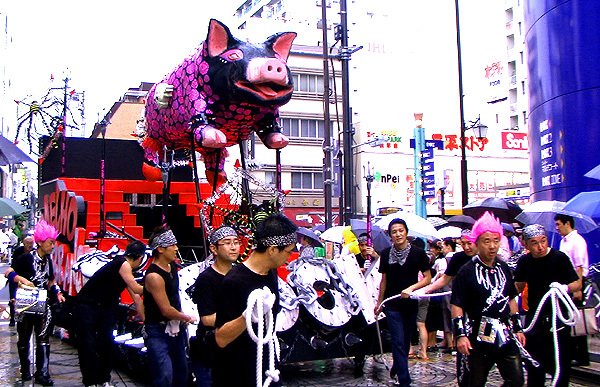 Another odd ensemble was a group of pink haired heavy metal guys pulling a float from which hung suspended in air a black pig with large pink polka dots and skull and crossbones. My favorite one that summed up Japanese cutesy-ness was the midriff-baring girls wearing polar bear paws as gloves and a polar bear head as a hat. 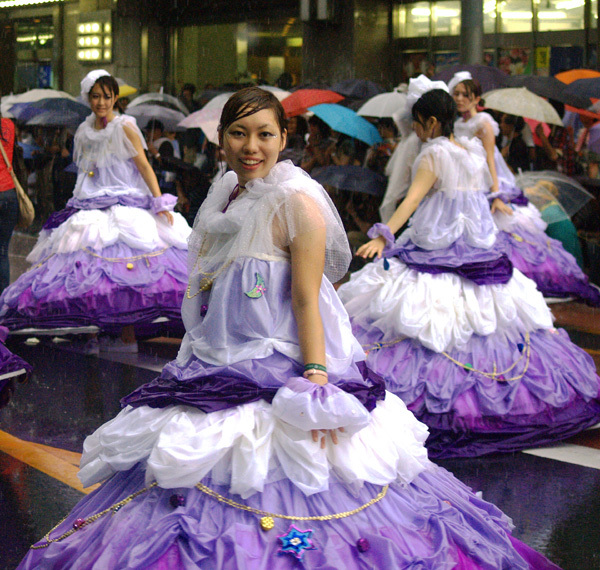 The weather in Tokyo has been strange recently and it's dubious presence was felt at this year's Samba event. At the beginning, it was sunny, hot, and very humid. Sweat rolled down performers and spectators alike. Then suddenly the skies darkened and shortly afterwards rain began cascading downward. Spectators either opened umbrellas or fled under awnings. 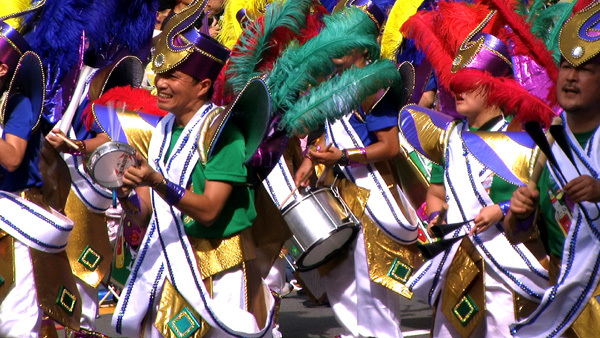 The samba performers did not have either option. Surprisingly they didn't call off or postpone the event. Undaunted by the pouring rain and the potential for electrocution by their sound systems, the samba performers wiped the rain from their brows and resolutely carried on. The samba dancing girls discarded their feathers weighed down as they were with rainwater. 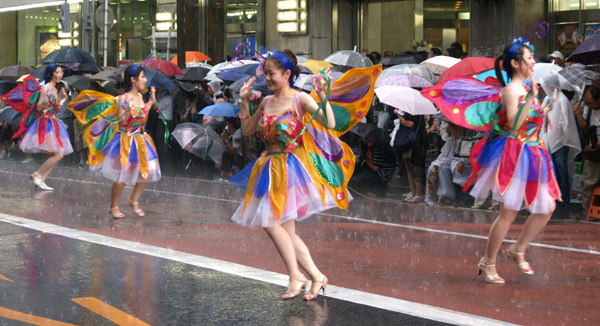 On the bright side, the nigh-naked once-befeathered dancing samba girls were now unfeathered wet dancing samba girls - a silver lining to our rain cloud.